One of the most important ancient cultivated plants, flax evolved alongside civilizations until it was ousted by cotton and canola. While it could be grown for its pretty blue flowers alone, its Latin species name "usitatissimum" - meaning most useful - refers to its dual functions as a source of oil and fiber, from which linen is made. The seed contains up to 35% oil, rich in essential omega 3 fatty acids. We powder the seeds in a coffee grinder/spice mill and use them in smoothies, cereals and baked goods. The seeds can also be sprouted. 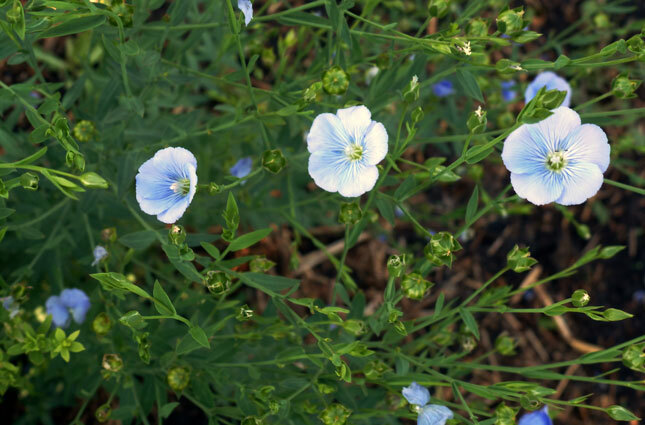 Flax is an easy to grow annual reaching up to 1 m (3 ft) tall. Plant 2.5 cm (1 in) deep in rows 15 cm (6 in) apart in full sun around mid-May. Thin to 5 cm (2 in) or more between plants. Harvest in the fall, when the dried seed heads resemble golden globes.